Today I managed to create a card .... even though once again the little one had only a little nap ... sigh. Luckily I had coloured my image last night. And wouldn't you know it ... I kept waking up in the middle of the night thinking about how to put together this card ....... oh no I think I have a problem .... will have to start completing my cards before I go to bed I think ha ha ha. 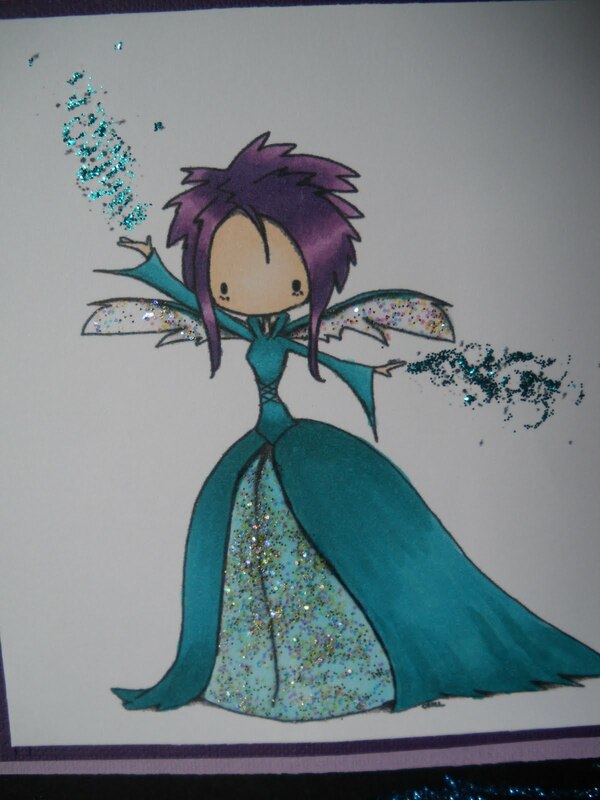 I coloured this absolutely gorgeous Tiddly Inks Cast Your Spell fairy .... Isn't she stunning! She was lovely to colour. I used some glitter glue on her dress, wings and fairy dust. On the base card I used a Martha Steward Glue Pad and some Glitter that I picked up from the local Spotlight store. I hadn't used either of these before. Actually quite easy. The stamp I used was a Crafty Kids G17K Flourish. Wish I had some turquoise glitter .. it would have looked spectacular. But I must admit I do like this lovely blue against the black card. Hard to see the background ... but its very pretty. Isn't she just gorgeous! Can't wait to colour her in something different. 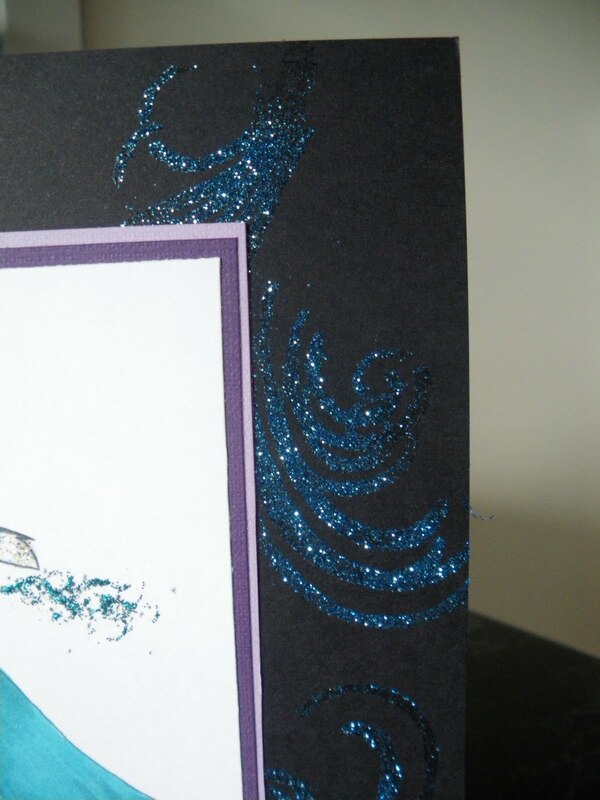 Here is a close up of the glitter ... it is very fine. Its Martha Steward Glitter... quite nice. She is TOTALLY gorgoeus!!! 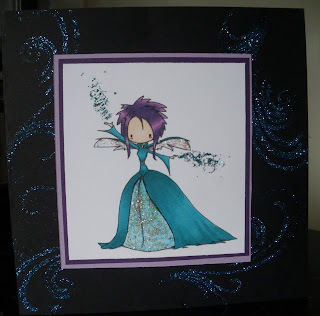 I love the colors you've used and I totally get the imagery of this stunning fairy! Such a gorgeous image and I love you glittered background. OMG, Carly your colouring is so gorgeous! Lovin' the bling too!! Your card is lovely! Glad you entered it in our challenge this week! oooh its carly again with another stunner!! love the wandy wavey idea hun!! LOL - you are funny - this totally qualifies as it does seem the leaves change overnight! This is gorgeous and I love the rich dark colors! Thanks for joining us at Tiddly Inks! wonderful color and I love the sparkle! Thanks for joining us for this week's Tiddly Inks Challenge! This is so pretty! Love the sparkle! Thank you for playing along with my flutter by challenge! 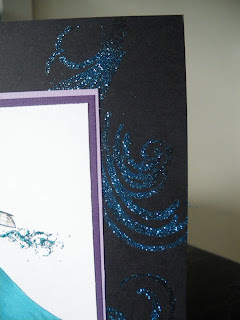 Such a fun background with that blue glitter! :) So happy you joined us at Flutterby Wednesday this week! Fabulous card! The blue glitter is so pretty!